Studies show the numerous health benefits of the polyphenol-rich Mediterranean diet, but many Americans do not eat enough fruits, vegetables, nuts, legumes, fish and olive oil ? the very foods that make Mediterranean dietary habits so healthy. 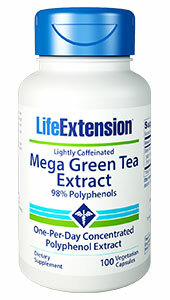 Now, Life Extension® offers our Mediterranean Whole Food Blend, a potent and proprietary blend of pomegranate, grape seed, artichoke, olive leaf, walnut, pecan and lentil extracts. Made from farm-sourced ingredients extracted using PhytoClean™ technology, our Mediterranean Whole Food Blend is a great way to augment your food intake with the health benefits of the polyphenol-rich Mediterranean diet. Polyphenols for your heart, and everything else! One of the reasons the Mediterranean diet is so healthy is probably the high volume of polyphenol rich foods, such as olive oil. Polyphenol compounds have been shown to support longevity as well as promote healthy heart and vascular function.8-9 But polyphenol rich foods are deficient in the United States: According to the CDC, Americans are not meeting their daily recommended intakes of fruits, vegetables, nuts, and legumes ? polyphenol rich foods which make the Mediterranean diet so healthy. That’s why adding Mediterranean Whole Food Blend to your daily nutritional regimen is such a good idea: it contains a potent and proprietary blend of pomegranate, grape seed, artichoke, olive leaf, walnut, pecan and lentil extracts. This unique blend delivers 133 mg of diversified polyphenols in each capsule. The polyphenol rich extracts in our Mediterranean Whole Food Blend come from fresh, farm-sourced ingredients. And those ingredients are extracted using PhytoClean™ technology: a novel, water-based extraction technique. When pressurized at elevated temperatures, water’s polarity is lowered to the same level as ethanol. 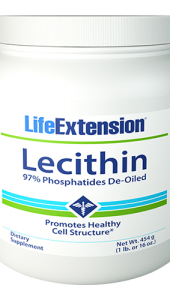 This increases ordinary water’s ability to solubilize superior bioactive compounds, without unnecessary excipients ? making the PhytoClean™ process the ideal method for creating the pure, potent phytonutrient extracts as the ones in Mediterranean Whole Food Blend. Mediterranean Whole Food Blend is by no means a substitute for a balanced diet and a healthy, active lifestyle. But it can help you augment your food intake with a daily dose of healthy, Mediterranean-inspired polyphenols. Harness the health benefits of the Mediterranean diet. 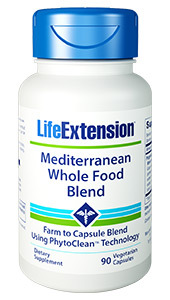 Add Mediterranean Whole Food Blend to your daily nutritional regimen today! Other ingredients: vegetable cellulose (capsule), microcrystalline cellulose, silica, stearic acid, chlorophyllin. Contains tree nuts (walnut, pecan). Non-GMO. The PhytoClean™ Method is a patented bioactive extraction method. Take three (3) capsules daily with or without food, or as recommended by a healhcare practitioner. Can be taken together or in divided doses. 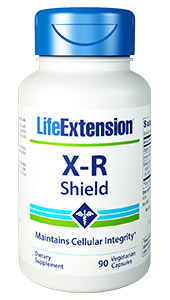 If you have gallstones or a biliary tract obstruction, do not use this product. Do not take if pregnant or lactating.